Hi! We are the ‘Introcie’ (introduction commission) 2018/2019! 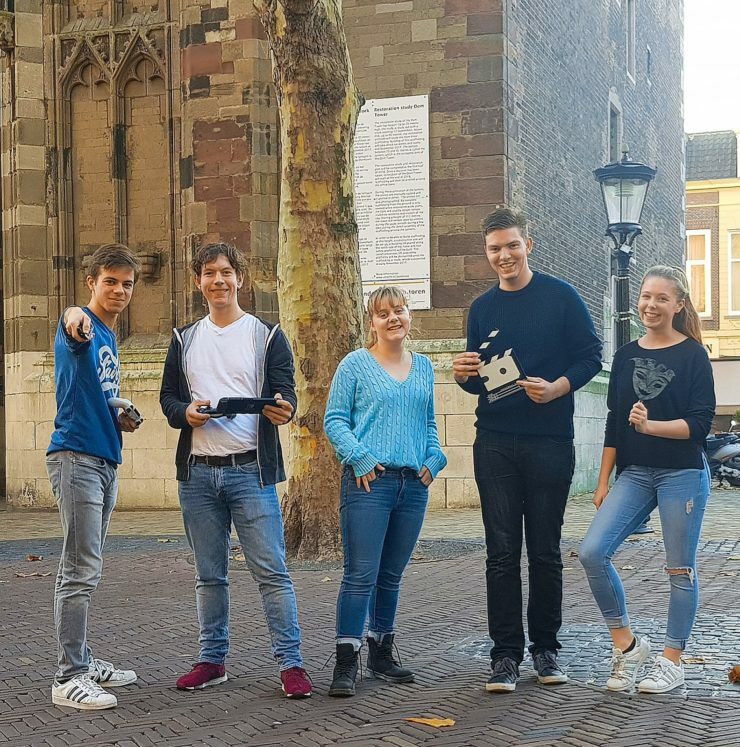 We are organizing the introduction days for Media and Culture in 2019. Everybody will be introduced individually below, but we also have a lot in common. For example, three of us can’t tie their shoelaces properly, because they never learned to do so. Half of us thought ponies were just baby horses. All of us are not a fan of the word “fan”. It reminds Sander of women well in their forties wearing tight pink T-shirts at a “K3” concert. We own collections of animal figurines and rubber duckies, and those of us who had music lessons didn’t show up at their last lesson. As lone survivor of the Introcie 2017/2018, Chiara is the chairman this year with 1.54m tall. The lack of a growth spurt seems clear, but did you know she still has most of her milk teeth? Furthermore, she learned about Darwin’s theory for the first time from her history teacher in high school. She also had a Disneyland Paris annual subscription #jealous. What Chiara can’t stand, is a disorder. For example, she still has a Stabilo penholder with all the colors perfectly arranged. Her collection of rubber duckies must have been well organized as well. If you want to know anything about gaming or geek culture, you can always count on our treasurer Marvin. That’s because he has an encyclopaedia of useless facts about this subject built into this head. Did you know Pacman was originally called Puckman? For the rest, Marvin’s a bit slow. He could only talk full sentences when he was 8 years old and learned to ride a bike when he was 10. He also stopped believing in Sinterklaas (a kind of dutch Santa Claus) around that time, but that’s only because he thought he wouldn’t get any presents anymore otherwise (then again, who didn’t?). If you considered studying the Dutch language, being the secretary seems a wonderful function to fulfill. This was the case for Sander. That’s why you can make him very happy with beautiful Dutch sentences. However, the use of English words in Dutch is an absolute no-go if there’s an easy Dutch alternative for it. Sander also hates having a Christmas tree before December, even though traditional Sinterklaas sweets during summer are no problem. A lot of people say his taste in movies is “terrible”: he enjoys romcoms from the ’80s and ’90s and films like Grease. Besides being the PR official, Julius is a true music fanatic. He owns ten instruments and can rap songs like “Rap God” and “Alphabet Aerobics” by heart. Something he despises is frogs, even though candy frogs are his favorite sweets. He did jump into a pond next to his high school, which he skipped his history lesson for. Furthermore, Julius loves games. He has played Pokémon games for more than 1000 hours and plays a game of Rocket League or World of Warcraft almost every day. Last but not least the Introcie wouldn’t be complete without the activity coordinator, which is Zoë this year. She never believed in color blindness, until she had to admit she had it herself when she was 14 years old. She was too busy eating applesauce. She actually ate applesauce with everything (yes, even pasta and the like). Zoë also likes books. Not necessarily reading them, but just looking at them. She does get really nervous in libraries because she dislikes big silent rooms. Imagine making a noise and everybody looking at you!